WESTFIELD, MA- Jean S. Hansen, 96, of Westfield, MA died October 29th, surrounded by her loving family. She was born in Rome, N.Y., daughter of Roy and Marion Shaver. She graduated from Branksome Hall in Toronto, Canada and Scarsdale High School, Scarsdale, N.Y. . She met the love of her life and husband of 75 years, John M. Hansen, at Cornell University in Ithaca, N.Y. where she studied at the College of Home Economics and was a member of the Kappa Alpha Theta sorority. She and John married and were stationed for three years in Norfolk, VA, where John was a Naval Officer during WWII, before coming and settling in Westfield, where they built their own home on Western Avenue. 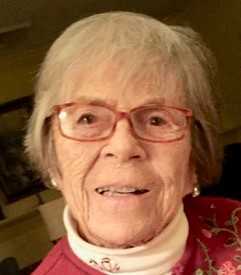 Jean was a leader of brownies and scout troops, Sunday school teacher at her beloved Westfield Methodist Church for 24 years and active in their organizations there. She helped organize the garden and volunteer groups of the Westfield Womens’ Club and was a member of the Tuesday Afternoon Club. Her love of nature and beauty was unprecedented and she won awards for her flower arrangements and was an avid bird lover and enthusiast. Jean was a friend to all and had a heart of caring for everyone she met. She lived every day to the fullest, having a strong faith in her Lord and Savior Jesus Christ and serving Him right up to the end when she was called home to eternity with Him. She is survived by her husband, John M. Hansen, her son, Eric M. Hansen of Bradenton, Florida and her daughter, Karen Anne (Hansen) Rich and husband, William R. Rich of West Springfield, MA. She leaves her Grandchildren, Christianne (Rich) Pease and husband, Benjamin Pease of Shoreview, MN, and their three children Timothy, Corinne and John Pease, Lindsay (Rich) Cavner and husband, Jonathan of Colorado Springs, CO, and their daughter, Avery, and Jeffrey W. Rich and wife, Allison of Morrison, CO. and their four children , Ella, Micah, Caleb and Xander Rich. A very special thanks to her caregivers, Lyubov Lukomski, Victoria Stepchuk, Lyuda Novak, Agnesa Protsun, Ella Nemchinskaya, Diana Stepchuk and Natasha Harding, who made it possible for her to stay in her own home. A Memorial Celebration Service of Jean’s life will be held on Friday, November 23rd at 2 p.m with a reception following, at the Evangelical Covenant Church, 915 Plumtree Road, Springfield, MA 01119. Memorial contributions can be made in Jean’s name to the Evangelical Covenant Church or to the First United Methodist Church, 91 Court St. Westfield, MA 01085.